This entry was posted in News by Hamish. Bookmark the permalink. I did not attend the meeting, so apologies if others may have expressed similar opinions already. I suspect I am in the minority, however, when I say that cycling should not be allowed in the park at all, as used to be the case in every public park in Edinburgh. Parks are places of respite from traffic and are not commuter routes. Most cyclists are thoughtful and sensible people, but there is a substantial group whose self righteousness and selfishness seem to give them license to be abusive. Within a couple of days of the cycle lines being brought into operation I was harangued on two occasions by cyclists when I strayed into the cycle route, as well as witnessing a young mother wheeling a child in a pushchair being shouted at by an irate cyclist. I visit the park several days a week and have observed the excessive speeds at which many travel, endangering any pedestrian and especially children, never mind people like me who are not so steady on their feet these days. I would suggest that cyclists be obliged to dismount and wheel their bikes through the park. It’s not a long distance and would hardly inconvenience them. Their lack of consideration for others is only made worse by the idea that certain areas are ‘only for cyclists’ and that they can therefore do what they like in that space. 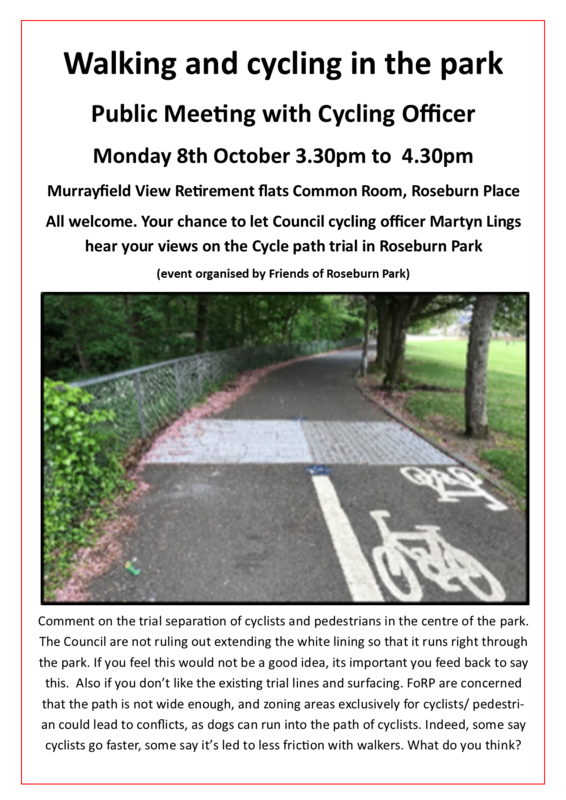 Many parks in London do not allow cycling and I would encourage Roseburn Park to follow their lead. Thanks, Pete. I’m encouraged others feel the same as me!